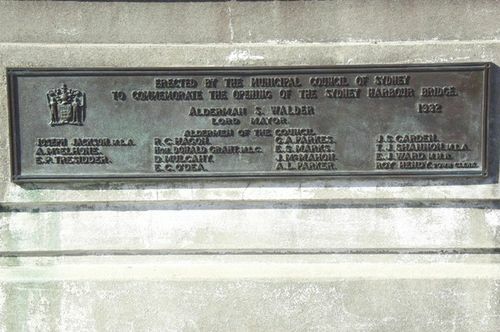 Plaque erected by the Sydney Municipal Council commemorates the opening of the Sydney Harbour Bridge in 1932. Under the directions of Dr J.J.C. Bradfield of the NSW Department of Public Works, the bridge was designed and built by British firm Dorman Long and Co Ltd of Middlesbrough and opened in 1932. The bridge's design was influenced by the Hell Gate Bridge in New York. It is also the sixth longest spanning-arch bridge in the world, and it is the tallest steel arch bridge, measuring 134 metres (440 ft) from top to water level. Elaborate celebrations will attend the opening ceremony, on March 19th of the colossal bridge spanning Sydney Harbour, the largest one-span arch bridge in the world. This enormous structure, taking over eight years to build, will have cost nearly £10,000,000 including the massive approaches, at the time of completion. There are 50,300 tons of steelwork, 37,000 tons of which make up the huge span alone.